At this moment I am lying in the sofa feeling sorry for myself. The reason is that I have been attacked by a stupid cold. Had to stay home from work and all... Luckily I have the weekend off and I can hopefully get well soon by resting up. I have had this post half ready for a while and I had about enough energy to finish it today. So here we go. I am such a bad girl. 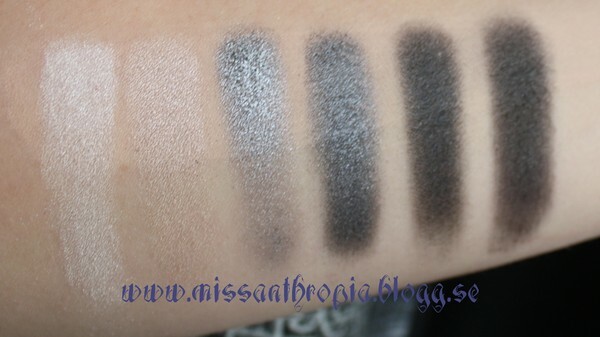 Having laid my hand on new eye shadows and not shared swatches with you! 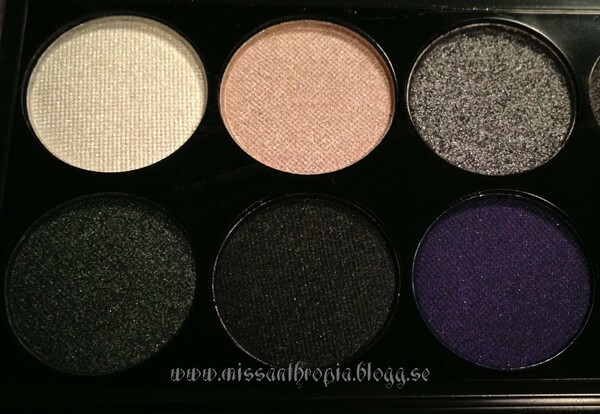 I kind of have become addicted to Sleek`s eyeshadow palettes. I just love them, such good quality for almost no coins at all. Every one I own is just so well pigmented and have such pretty colors. I think I might have started collecting them.. I usually buy them from smink.net because of the super fast and free shipping and because I always get my mascara from them too. But you can probably find them for less money somewhere else. 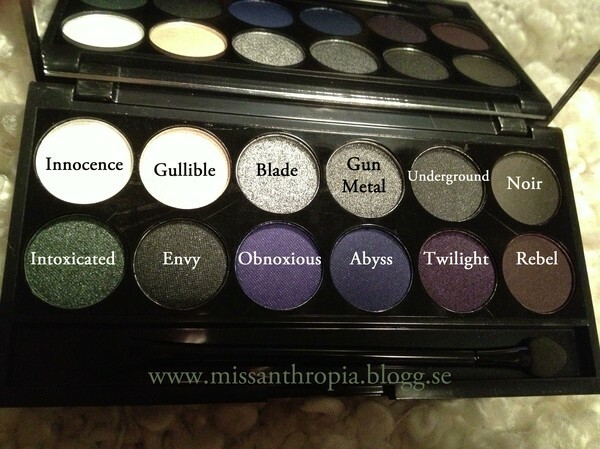 And as you can see is this palette called Bad Girl. Every shadow have a name, I like that. Lets see the upper row on my arm in day light. You can see i have a primer on half of the swatch. The shadow benefits from the primer. My primer is cheap, cruelty free and works super well. 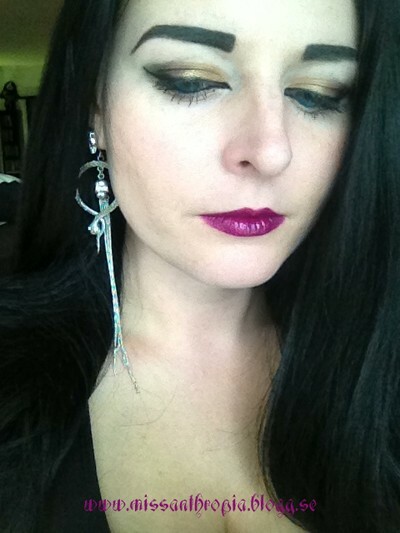 I use the mineral primer from e.l.f.. If you don`t have one you love I definitely recommend you to check it out. They have 40% at the moment so it`s even cheaper. Get to it by clicking Here! And here you have the other row of colors. 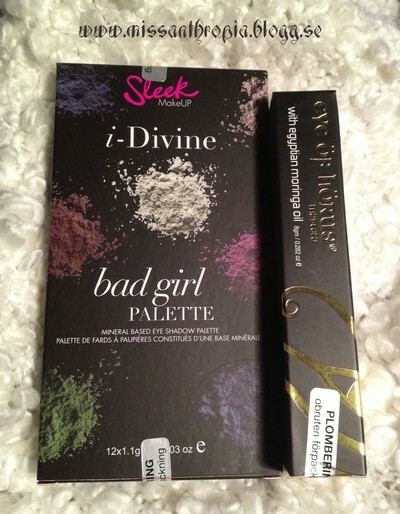 I use this palette quite a lot and the shimmery ones are the favorite colors. Especially the green called Intoxicated. 1 assignment for each month. Well, this spring a lot happened on a personal plan and this list was no longer a priority. But I have not given up on it. 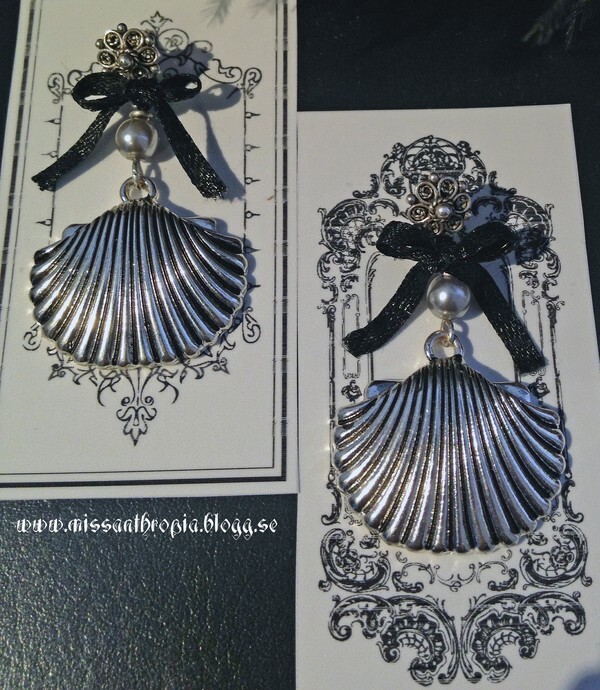 So here you have Make a pair of earrings! 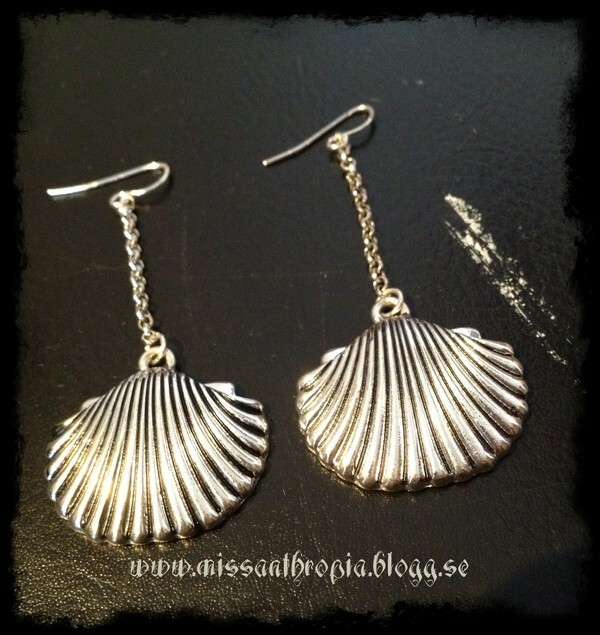 I bought these earrings on vacation this summer because I just loved the seashell so much. But they didn`t look right to me, rather unfinished on the long boring chain. So I just had to give them a new look. 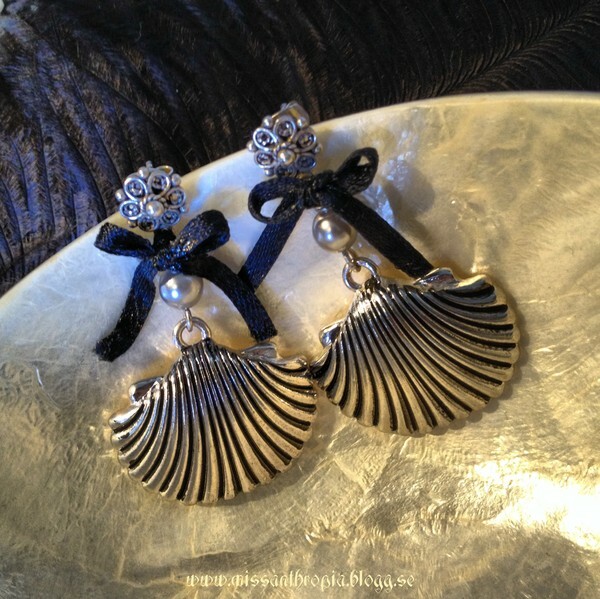 Now they look more my style with black satin bows, pretty silver studs and a pearl to top it off with. I am really happy with the end result. I wore them out to dinner yesterday and felt great! I love how they make me think of the summer I had together with my Christian and memories of our vacation springs to mind. I am also going to throw in the picture I posted on my Instagram. 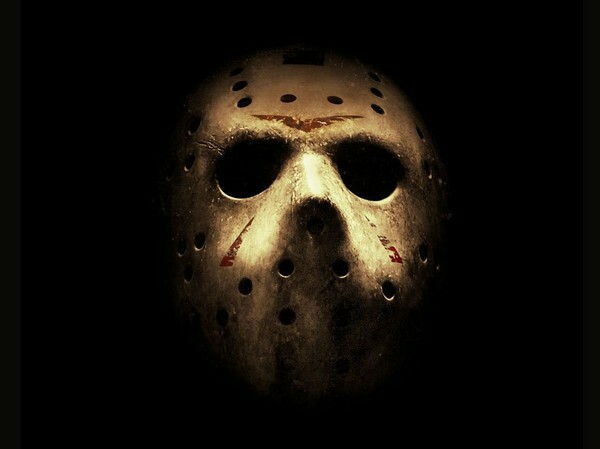 Feel free to stalk me there too. 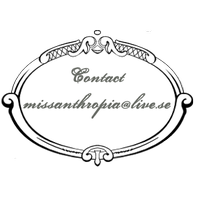 I am miss666anthropia. Hi guys. So sorry I haven`t updated my blog in a while. The days just keep slipping trough my fingers like water. I have been working as usual and last weekend we had my family visiting, I even have started to make use of my new gym membership. It feels good to be back in normal routines but it sure don`t leave much time for blogging. I thought I could show you my newest member on my bathroom shelf! 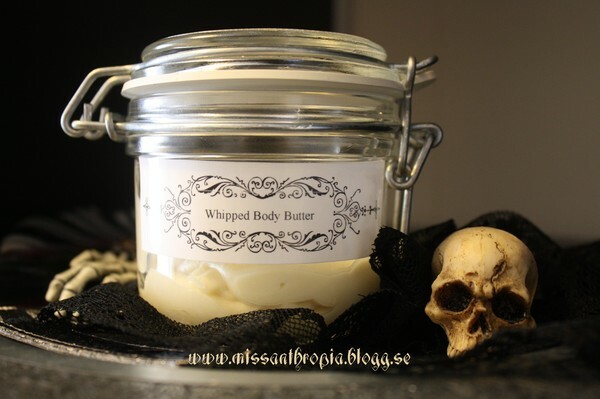 My home made whipped body butter! As we move towards colder weather my skin is needing some extra help to keep soft and moisturized. I usually buy Body butters from different shops on Etsy but I always have to pay such incredible high shipping costs. So I got the idea to try to make some of my own. Guaranteed cruelty free and better for my economy. I searched the internet for some recipes and where to buy the needed stuff. I found a little shop where I could get the hold of the basic ingredients to a fair price and everything is also fair trade, cruelty free & vegan friendly. They even had been cutting the middle hands so the producers get paid more for their work. Could I have found a better shop or what!? The shop is called Sheabutter Cottage. To get there just click the picture below. The almond oil I got at my local drug store and the Coconut oil Is from my nearest grocery store. Here is my jar! Got a regular jam jar and printed out a lable also found online. I have of course tested it out and I love it! A little goes a long way and it also feels good to know that there is nothing harmful or bad in it. Is this something you would want to try yourself? 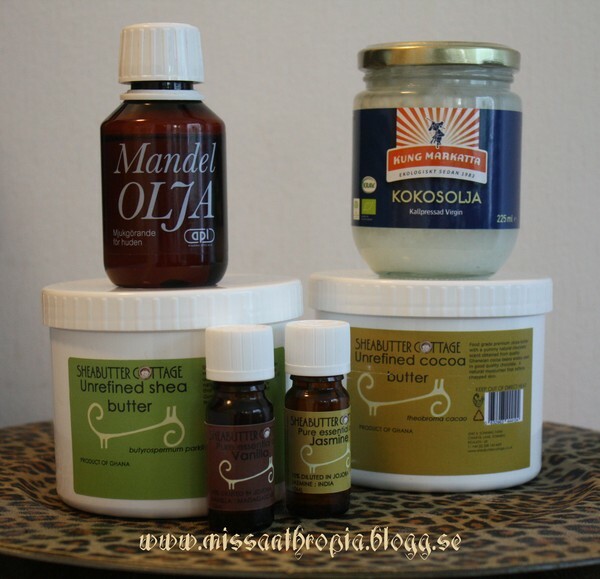 Today I ordered some stuff to make home made skin products. I will make a post about it later on when I have received the ingredients and tested it out. I long to be more creative again and can`t wait to try this out. I have also received a new dress, heels and cute stockings that goes so well with everything that I will try to make a outfit post again. Maybe it can be done next week. The rest of this week is completely booked. This Tuesday I was at H&M while waiting for my love when I discovered that they now carry my size in bras! I tried a couple out and actually bought myself a new set. I don`t think I ever can get enough underwear. The set is in grey lace and not black as I usually buy but the black sets didn`t come near this one in comfort. In the picture you also can see a pair of velvet leggings and new seamless hipsters to use under my workout tights. The velvet leggings were cheap and from China (ebay), sadly they didn`t fit well, they where a bit to short and tight in the legs and the waist is to wide... typical, otherwise they where just the right fabric and color. I often have that problem with leggings. I guess I am a weird shape. I have been receiving some packages in the mail lately and I haven`t really had the time to make post about them! I will try to be better. The weather outside is starting to look like fall and that means more computer time so hopefully I will have the time for it soon. Now you will at least get to see my new Lime Crime gems. I got my package after a little bit of a scare. The post office didn`t find it even though I had my little piece of paper telling me it was ready to be collected. I was scared that someone had stolen it. Oh the horror! After a couple of days later they called me and told me they had found it when they had done their weekly inventory. Thank the make-up god for that. 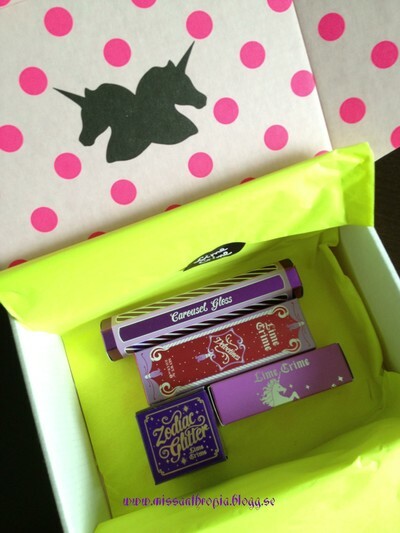 I just love getting Lime crime packages. I am a sucker for beautiful packaging and they always have every detail thought of. This time the box had polka dots and neon colors. I have worn all of my new lip products. The glitter is yet to be tested. I think I will try it in on my nails first! 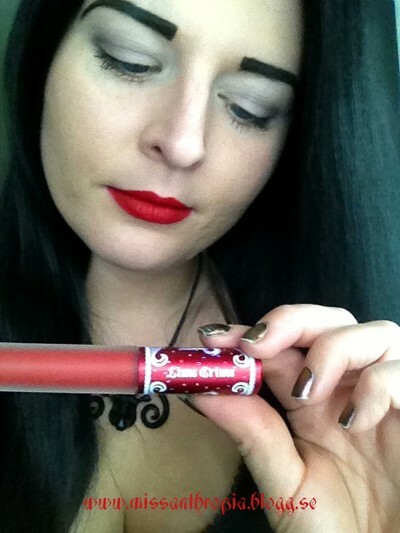 Here I am with the Velevtine on my lips! And I just have to say I totally loved it. I had no troubles with the applying and it lasted sooo long on my lips. It dries completely matte and the color is stunning. The perfect red. With my pale skin and black hair I get a snow white look I love. I think I will need to get myself a lip liner though or a kind of lip primer? I bleeds a little bit. I need to get one for my red candy apple gloss anyways. 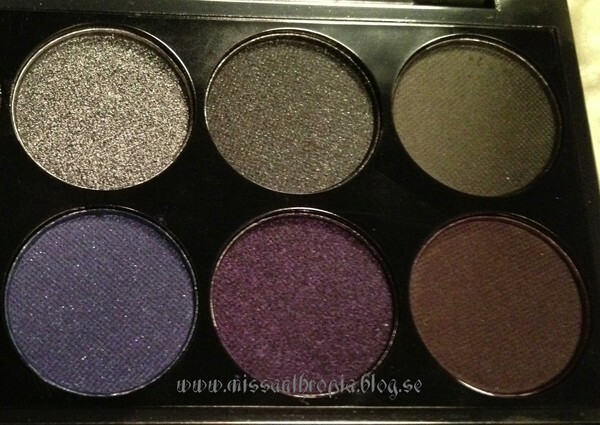 I must tell you that I have been toying with the idea of blending a bit of black eyeshadow with it. I think it would be fun to see if it looks good a tiny bit darker too for those days I crave darkness. And this was me today with Poisonberry. Absolutely amazing color too. The only thing that would concern me is that It`s not nice to apply on dry lips. The color looks very dark in the creases. Like I had today. I really need to drink more water... especially when I have eaten sushi with lots of salty soy sauce. Maybe I will have the time and inspiration to photograph the lipsticks with my good camera again. I guess the laziness in me is hard to get rid of, lying in the sofa is just so much more pleasant than sweating and getting work out pains afterwards. But today I finally went and got myself a new membership. I went for a new gym this time. They have a lot more group training classes to offer and tons of work out equipment. Besides that they are huge, blending in and "hide" will be much easier. When I go to the gym the last thing I would like is someone talking to me and bothering me. In this new gym I even have the possibilities to swim if I feel like it. That can be a super nice alternative to work out in the cold winter times. Oh my. I am going to suffer big times... I get out of breath so easy now a days and getting back is going to take some time. 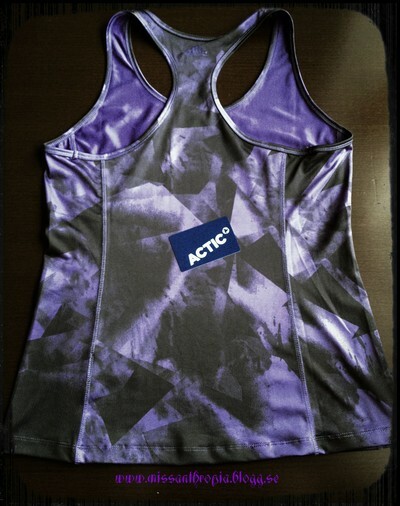 I picked up a new work out top today too, It`s from HM and I is in purple! Love it. And on top of it lies my new shiny, expensive gym card. Do any of you work out? It would be fun to know what kind of exercise you like the most. 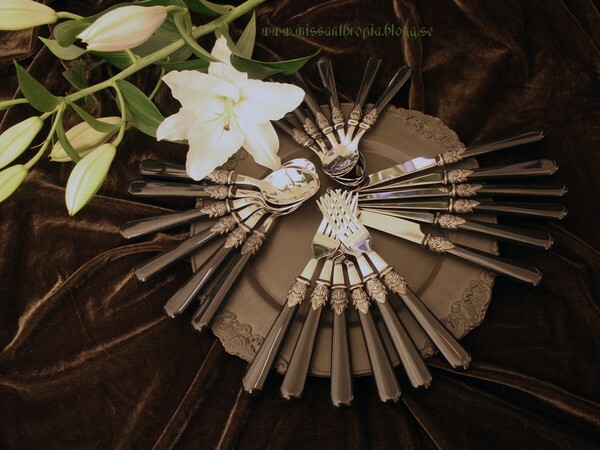 I have gotten some new treasures for our apartment lately and I thought I could share them with you. 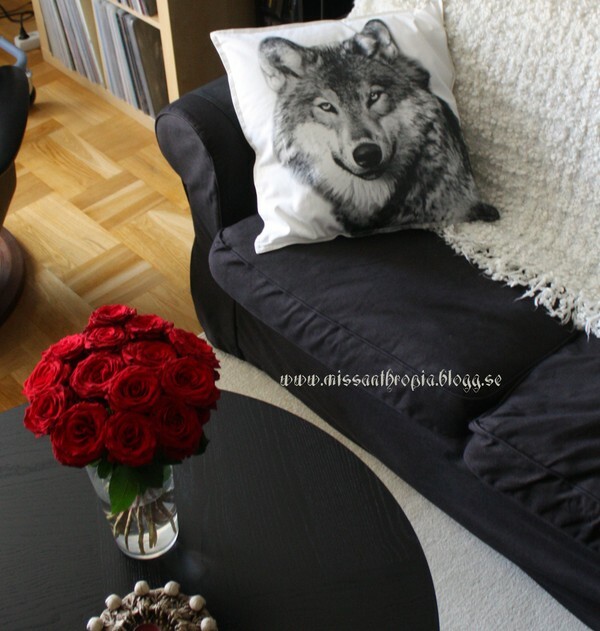 I have been wanting a wolf pillow some time and found one just perfect at Hemtex here in Sweden. I just bought it and luckily my other half also likes it♥ I got a Game Of Thrones feeling to it... shhh, don`t tell him! I love cut flowers and I also have a nice discount where I work so I think I am going to try to always have a bouquet at home. They gives such a nice feeling of luxury and I get so happy just looking at them so it`s very well worth it. 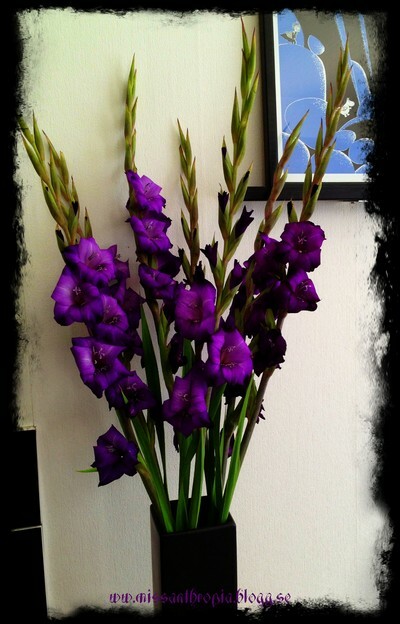 These beautiful red roses are long gone and at the moment I have long purple Gladiolus instead. They look a million times better in person. But for you who aren`t that into flowers you get a picture. The buds looks like black velvet and they bloom in bright purple, when they wilt they start loosing their color and goes light purple. Hurry if you want them yourself. They are here only a bit into fall and then they disappear and others takes their place in the stores. I also have managed to sell a bunch old Rörstrand tea mugs online. I think I got them together with a bunch of other old random china when I first moved here and I really didn`t like them as much. I just kept them because I didn`t have anything better. They have for years been stored away in a cardboard box and I just felt it was a shame. Now they are in a better home with a mom who is giving them away as a Christmas gift to her daughter which is collecting them. I used some of the tea mug money and a gift certificate I got at my last birthday to buy myself a Kosta Boda bowl that have been on my mind for about one and a half year. 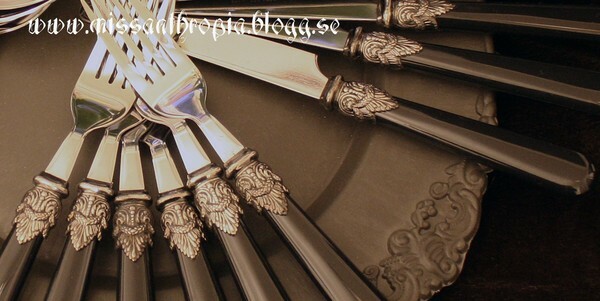 I remember when first saw it in a shop window in Gothenburg together with some glass skulls. I thought it was so perfect, dark and beautiful. 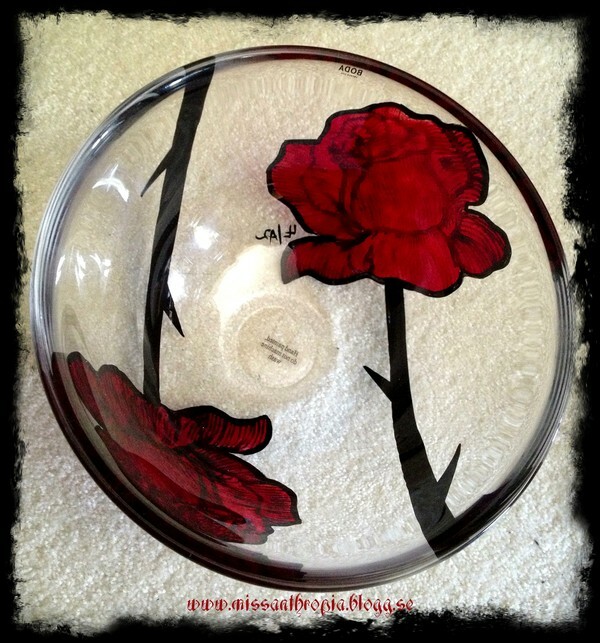 The bowl is called Tattoo and are made by Ludvig Löfgren. 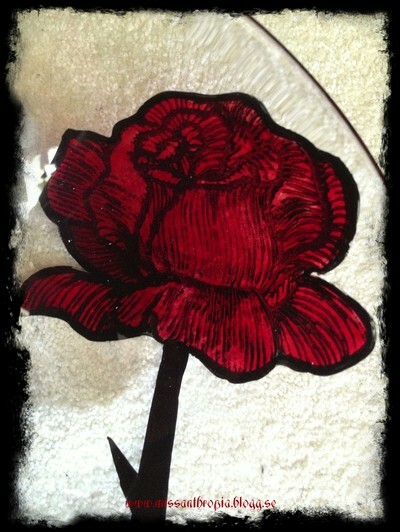 I need to get it at proper tablecloth to place it on. It didn`t contrast well on my black living room table. I am thinking something in a creme color and perhaps lace. We`ll have to see what I can find.. I have also gotten big ivy on a double bow that creates a globe and other small pretty stuff that I can show some other time. There is just something special about fall that makes me stock up on petty things to let my eyes rest on and invest in cozy pillows and blankets. I guess it`s because we up here in the north prepares for the long winter that is coming our way.